The Cedars is one of those absolute must see and do’s whilst in South Australia, but it largely remains an undiscovered gem. The family home of Sir Hans Heysen, arguably the best South Australian landscape artist, visionary and environmentalist. The property consists of the home, Hans and Nora’s studios, gardens, shop and gallery and can be viewed on a guided tour, self guided tour or with free access to the shop and gallery. Wilhelm Ernst Hans Franz Heysen was born in Hamburg, Germany. He migrated to Adelaide in South Australia with his family in 1884 at the age of 7. As a young boy Heysen showed an early interest in art. At 14 he left school to work with a hardware merchant, later studying art during nights at Art School in his spare time. In 1912 Hans Heysen had earned enough from his art to purchase a property called "The Cedars" near Hahndorf in the Adelaide Hills, which remained as his home until his death in 1968 aged 90. Hans Heysen was remembered for his remarkable paintings. The Heysen Trail which extends from Parachilna Gorge in the Flinders Ranges to Cape Jervois on the southern coast was named in honour of him, as was the Heysen Tunnels on the South Eastern Freeway. His daughter Nora Heysen was also a successful portraiture artist, and her work can also be viewed at The Cedars. Take a guided tour of the house and historic working studio of Australian landscape artist Sir Hans Heysen. The Cedars is a gracious old home still owned by the Heysen family. It houses a fine collection of paintings and drawings displaying Heysen's remarkable versatility in subject and medium. 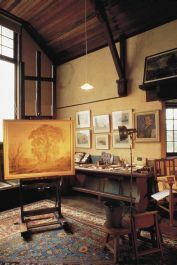 Also on the grounds, see Heysen's working studio, built in 1912 and used by this iconic painter until his death in 1968. See his painting materials and tools, sketches, notes and more. The rambling cottage garden is part of the South Australian Open Garden Scheme but is open for enjoyment daily. A walking trail is also featured on the 60 hectare property and directs visitors to favourite painting sites used by the artist. Guided tours: of the house and studio daily except Mondays.